DEVTECH d.o.o. raspisuje oglas za poziciju Solution Architect. Za obavljanje ovog posla neophodno je dobro poznavanje jezika na kojem je oglas napisan. Ukoliko tekst oglasa ne razumete u potpunosti, savetujemo vam da razmislite da li je ovo pravi posao za vas. 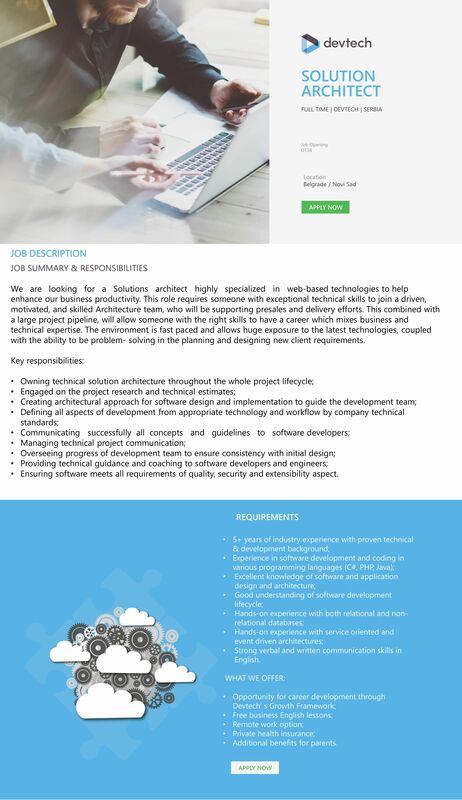 DEVTECH is a privately owned software development and IT services company with offices in the UK and Serbia. Managed by an experienced team of Cloud pioneers and Hosting veterans, we work with Enterprises, ISVs and Service Providers in Europe and the Americas.We enable companies to succeed in the development and integration of Cloud and Online Services by providing technical resource and expertise on a flexible basis.